The first thing while learning HTML we get attracted to is heading tags. Even, I was attracted to the heading tags while learning the HTML. Well, in this post I will be sharing with you, that what are heading tags? How can you use them to write a post or Page while developing a website or a Blog? And lastly that how heading tags affect SEO. Without heading tags, it is not possible to read the document properly, or it becomes a lot harder to judge a topic. By the use of the header tags, we are able to differentiate the content. These tags are used for making the size of the Text Bold or large. Moreover, these heading tags help the search engines to grab the information from the post and pages easily. How many heading tags are there? Any website that teaches or any institute that teaches HTML confirms that these tags are from H1 to H6. Well according to the sites that provide web development tutorials claims that H1 is the most important tag for any web page or post. Whereas the last one H6 is the least important tag used on the web documents. These Tags have different Sizes, Just check the size of these tags from the below classification. You can apply these tag code like <h1>some text</h1>, and likewise, other tags will work the same way. How can you use these tags to write a Post or page for your website? Well, H1 tag comes first for sure. 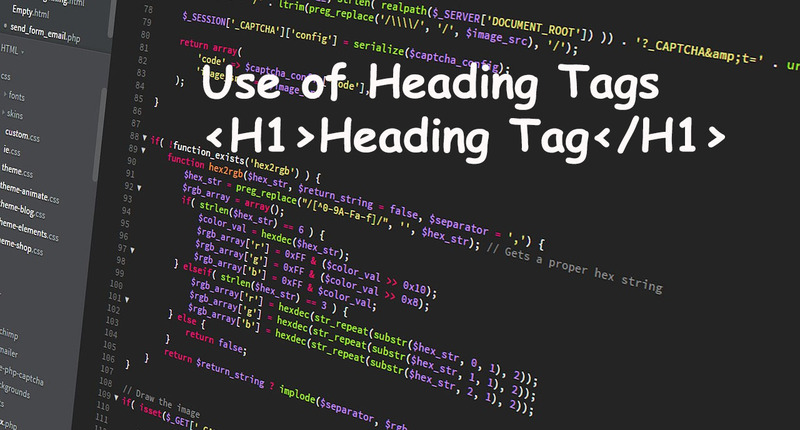 For the headings of your pages and posts, you can use an H1 tag which is the largest size of the text. Then you can use the H2 tag for sub-heading in your post. And then comes the other tags H3, H4, H5, and H6 which can be used for the further subheadings. How heading tags affect SEO? These tags are not only used to design your web pages, but these tags are also used by the search engines to grab content and usefulness of the content. H1 tag is mostly indexed by the Google and sometimes acts as the title of the page when we don’t provide a different title. This can actually help in getting good ranking on Google SERPs for your web pages. Moreover, H1 tag helps to attract the people to read your content. Even the H2 tag plays an important role. If you are a regular user of SEO by Yoast, then you must have noticed that it only turn the button green when we place an H2 tag in our post and even it insists on placing the keyword in the H2 for better ranking. You can see the below screenshot for the same. Does Google Count Keyword in the Url? This is one of the most important things to be kept in mind. Hierarchically the smallest tags must be followed by the bigger tags. First, comes the H1 tag, then H2 tag and then so on till H6. In order to do Good SEO, you should follow the hierarchical order of the heading tags. Do you need to use the Keywords in the heading tags? The answer is yes; you should use the targeting keyword in the H1 and H2 tags. Use of the keywords in these tags will help in better ranking on Google SERPs. But for the other tags, I suggest you use Synonyms. You can use the LSI keywords in the H3, H4, H5 and H6 tags. Doing this will notify the search engine that you are doing a good practice of SEO, and as a result, you have better results at Google SERPs and increased domain authority. Don’t even Skip the usage of H2 and H3 tags in your web pages. Mainly H2 tag. Try to insert the targeting keyword in the H2 tag. Never Skip the H1 tag in your Post, this will be considered a bad practice of SEO. My aim was to tell you the importance of the heading tags for the web pages and posts. But if you think that I have missed something, then help me to make this post more valuable. Give me your opinion through your comments. Great tip you shared here. I am aware about H1 And H2 and I use this method in my post but never thought of the rest. And never knew the importance heading tags. Thanks for sharing this valuable tip. I am glad that you were able to learn something new. Have a good day. To write the evocating heading is the key to get more views. People like to reach the content with the proper heading. The structure of the heading is quite easy to understand. The H1 heading is the blog post heading which comes inbuilt in almost every WordPress theme. The rest you can manage according to your requirements. you have mentioned some really great tips about using those tags. It’s generally recommended that H1 and H2 tags are used in every article whereever they are fit while the H3 and other tags that follow can be used where necessary. And as you mention, a hierarchy needs to be followed. That’s what helps the user understand the flow of content better and search engines also take them accordingly. Good post Robin! I am glad that you liked the post. And thanks for stopping by and leaving a comment. Thanks for shared about Heading Tags, Basically, I don’t known about how many time use Heading tags on personal website article. Today I have learned new on this article, Thanks A lot again. Thanks for the sharing about heading tag which are equally important as tags and keywords. Even Headlines and tags are only thing which help ranking or getting good number of visitors. Very detailed information about heading tags, heading tags are very important for SEO as it helps the search engines to understand the divisions of your article, H1-H2 tags are crucial to slate your article with google’s pro-view. Thanks for stopping by and sharing your opinion with us. have a good weekend. An other informative post Bro. Using heading is must to rank in the search engine. Because, the bot search engine can’t read the text on your webpage, the text it can read it only H1,H2.. and so on. I’ve seen many bloggers make this silly mistake not using heading tags. Glad that you liked the post. And thanks for the comment. By the way, (feel free to delete this from the comment!) I’m having really bad problems with comments on my blog so if you can’t make a reciprocal comment on my blog I’d really appreciate you sending me any info evidence you get via FB. Some people can and some can’t, and I haven’t a clue why. I am glad that you are able to learn something new from my post. And I have successfully commented on your post and I think that is under moderation. So please check and approve. And may you have Good weekend. Yes, too much of everything is bad. So, thanks for stopping by. Thanks for sharing the importance of using tags for getting good search engine visibility. Have a great time blogging. Thanks for making header tags a lot clearer. Now I understand why as an Expert Author with PAC, Power Affiliate Club. Lesly insists that we use tags in our first sentence that reflects the title and use our keywords there. You made it very understandable. Will share your article on my Facebook Page. Use of the heading tags I really important and one must use them wisely. And thanks for the share. Wonderful to visit your blog again! Headline tags are important formatting tools used in every word processing application. Apart from segmenting content, It helps in good SEO of the post. Organizing a post is always advisable for better user friendly post; here comes the need of H1…H6 tags. It was lovely to read how these tags play an important role in getting better ranking on search engine. I am glad that visited my blog again and found the post interesting. Have a good weekend. A great and very informative post. Thanks for deeply explain about heading tag. It’s helpful for newbie like me. Thanks for this great post. keep it up. I think that we should use H1 to H6 headings in a proper way. You are right, if we not use H1 heading tags in the article then this is a bad SEO practice. Yes, without H1 tag we can’t rank on Google.